I have been receiving a huge download from the Holy Spirit as I seek more understanding of God and His Nature and Character. I admit that the thoughts are coming at such an accelerated speed that I find myself flipping from Scripture to Scripture to determine if what I am understanding is confirmed by God's Word. And I want to make it perfectly clear ... what I am about to share with you is from my own study of God's Word. This is my opinion, and by no means, should you accept what I say without doing your own study. But I am also declaring to you that I believe it is inherent upon [and necessary for] every Believer to search out God for themselves. He has given us His Word as a revelation of His Character and His Divine Nature, and far too many of us rely on our pastors, popular ministers, and online articles to define God for us. I have been convicted in my heart that there is so much of the basic foundation of God's qualities and character that we really haven't figured out for ourselves. Oh, we know all the words and probably use them often in our attempts to explain our theology: Sanctification, Justification, Redemption, Salvation, Faith, Grace. But, do we really know what they mean from God's perspective? Or put another way, do we search the Scriptures to understand how they are to be applied to our relationship with Him; that they are not just doctrines, but real dispensations from God to be applied in growing towards Him? For instance, I can say that I am saved by the Grace of God. But do I fully understand the implications of God's Grace? If you are like me, you've always understood the accepted definition of Grace as God's unmerited favor. Grace has been defined as the following: We have received forgiveness of our sins through Christ's death on the Cross, and there was nothing we did to deserve it. Grace has been given to us out of God's love and mercy; it's a gift. And that's usually as far as most Christians go with their understanding of Grace... it's a gift... and if you will allow me to apply a grammatical attribute, it's a noun. And here is the astounding revelation I received as I did a deeper study on the Hebrew (Old Testament) understanding of the word Grace, and the Greek (or New Testament) interpretation. In the Old Testament, the word for Grace is the Hebrew word chên. And, indeed, it is a noun, and it does mean a favor; whatever is pleasant and agreeable. What's more, there is no alternative word for Grace in the Old Testament --- everywhere it is used, it has the same meaning. In the Old Testament, Grace is usually applied in terms of "give favor" -- But the Lord was with Joseph, and extended kindness to him, and gave him favor in the sight of the chief jailer (Genesis 39:21); "obtain favor" -- I will grant this people favor in the sight of the Egyptians; (Exodus 3:21), or "find favor" -- And Joseph found grace in his sight, and he served him; and he made him overseer over his house, and all that he had he put into his hand. (Genesis 6:8). The Hebrew word chên comes from the word chânan, which includes the meaning to bend or stoop in kindness to an inferior. Strong's Concordance also says, "Generally, this word [grace] implies the extending of "favor", often when it is neither expected nor deserved". So, this seems to tell me that the modern Church's understanding of Grace is in line with the Old Testament perception. But when I looked at how God applies the concept of Grace in the New Testament, I saw a dramatic change. Grace becomes a verb! And just like in the Old Testament, there is no alternative word or meaning for God's Grace -- everywhere it is used it means the same thing. And the Greek word for God's Grace is charis. At its root it indicates an act of favor on the part of the giver, and thanks on the part of the receiver. Charis is related to sins and the attribute of God's Grace that they evoke. It is God's Mercy (the free gift of forgiveness of sins) and compassion that recognizes the misery that our sin brings us. It is God's tender sense of our misery that displays itself in His efforts [Grace] to lessen and entirely remove our misery. God's Grace is applied; it is bestowed; it is His power to equip us for ministry. This is what is shown us in Hebrews 4:16 ... Therefore let us draw near with confidence to the throne of grace, so that we may receive mercy and find grace to help in time of need. God's grace is a weapon in our spiritual war with the devil. It is help in time of need, which implies [to me] that God's power is behind it. And it is imperative [in our understanding of Grace] that we recognize it to be a way that we live our lives. And we must agree that God has an ability we do not have -- to resist sin. Therefore, living a righteous life is not from our own ability to resist sin, but God's ability to do a work in our heart that helps us to say no to the temptation. Grace empowers us through our relationship with God. Put simply, when we pray for God's Grace to never commit a particular sin again, it is His ability NOT to do it that invades our heart and enables and empowers us to stop the sin. What about our free will? When God activates His Grace in our heart (His ability to not commit the sin), our will has a choice --- continue in our pursuit of that sin, OR come into agreement with God and let His ability (power to resist the sin) become our motivation. This is the true understanding of that oft-quoted Scripture in 2 Corinthians 12:9 ... but He has said to me, “My grace is sufficient for you [My lovingkindness and My mercy are more than enough—always available—regardless of the situation]; for [My] power is being perfected [and is completed and shows itself most effectively] in [your] weakness.” Therefore, I will all the more gladly boast in my weaknesses, so that the power of Christ [may completely enfold me and] may dwell in me. When God's Grace is activated in New Testament Believers, there you will find the power of Christ. Grace is the manifestation of God's ability in any situation! 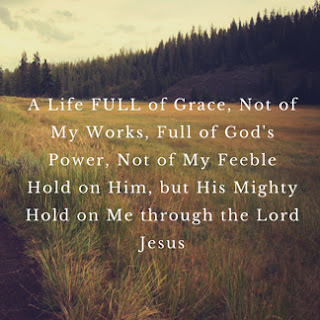 When the Apostle Paul wrote, By the Grace of God, I am what I am, I believe he was saying that Grace was the Ability of God surging through his veins and empowering him to do the work he did. Paul was plugged into God's Grace all the time. That's how he lived! And we can live that way, too! Every time we come to a challenge, we should ask ourselves, "Do I want to tackle this with my own ability [my own strength, wisdom, power], or with Jesus's?" I find it interesting that the first and last use of the word Grace in the New Testament involve our Lord Jesus Christ: And the child continued to grow, and become strong, increasing in wisdom; and the grace of God was upon Him (Luke 2:40); and The grace of our Lord Jesus Christ be with you all. Amen (Revelation 22:21). In both instances, it is the power and ability of the Almighty God [exhibited through Jesus Christ] that is being manifested. Let me be clear -- I accept the truth of God's unmerited favor in my life. But I don't want to settle for only that portion of His Grace. It want it all! I want His ability to resist sin to invade my heart, and I want His power to be manifested in all the works I do for His Kingdom. 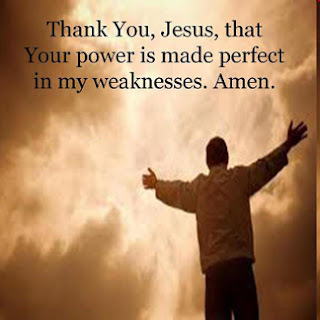 I recognize my own weakness and come into full agreement with Him; calling upon His Grace to be applied, to be bestowed, and to empower me to live a righteous life that pleases Him. That is what Jesus did, and He is Grace personified. Acts 20:24 "But I do not account my life of any value nor as precious to myself, if only I may finish my course and the ministry that I received from the Lord Jesus, to testify to the gospel of the grace of God". Wow, Pam, Awesome and I haven't even finished the first two paragraphs! What you are sharing (in words) dwarfs what I attempt to share with others about our Father and knowing Him not just on the superficial level. I nly wanted to be the first to thank you for your diligence in seeking out all truth because this is one article I can already tell will take me hours to digest over this evening! Thank you, but I feel the majority of my words came straight from the Bible or original context of the Hebrew and Greek writings. I am continually amazed at what God will reveal to us if we just take the time to try to understand what He inspired to be written in His Word. I know that I will spend the rest of my life seeking Him and asking for "more revelation, please"! And in doing so, my spirit soars! Bill, applying God's Grace (His power and ability) to our lives should take each of us on a journey ... to debunk our sacred cows of theology -- that we are to be passive recipients of that grace -- and to study what Jesus says about the power and authority [from God] that He has given us... How are we to use it, in His Name? Now that we know that Grace is a verb for New Testament Believers, and it is the ability of God to accomplish through His power, we should be bold and confident to call upon that power to help advance the Kingdom of God on earth. As you go forward from this day, be aware of all the ways this world tempts you to live unrighteously. As you are confronted with a situation, try praying a different way.... instead of asking God to take care of it for you, try praying for God's grace (power and ability) to come upon you so that you can exhibit His presence in your actions and life. It is really a matter of renewing your mind to a new concept of God, and then walking in that knowledge. It may seem like a subtle difference in your understanding of Grace, but it will have an extraordinary impact on your testimony. P.S. Try doing a word search for "grace" in the New Testament, and then read Scripture from this new understanding of it as a verb. Amazing! When the Word became flesh and dwelt among us.., we can therefore, no longer see grace as a potential action to occur in the future, ... but it (or He)has now become action and we are to be action also . Teaching us that, denying ungodliness and worldly lusts, we should live soberly, righteously, and godly, in this present world;... then , we are to be that 'action' now and no longer just a 'noun' and sitting still. That is not exactly the direction I thought I was going with this, but it does seem to fit just the same!?! I just love it when I hear from you because you are a person who actually studies the Word, seeks to understand how it applies to us, and then is willing to do it! You have really summarized the concept of God's Grace in a clear and straightforward manner. Now, if we can get more of the Body of Christ to embrace that we are to live out God's Grace (which implies action on our part) in the manner described in Titus 2, I believe we would see the Kingdom of God defeating the kingdom of satan. I can't wait for you to comment on tomorrow's blog! (Wow, this is so much harder to try to explain but it was so very clear when He was revealing it this morning). I do want to comment though about the 'download' the HS was giving you, if I may? I experienced that 'supernatural' download when I physically died(truck rollover caused a massive brain hemorrhage) and while out of the body, I 'focused my intention or attention' on 3 men whom I had been studying on earth and instantly received or was 'downloaded' all of their knowledge and(while I was there in my spiritual body) I comprehended and understood it perfectly!!!??! That is, I understood it UNTIL I came back into this flesh body again. Now, that happened almost 12 years ago and I have been putting together all of their knowledge and attempting to understand the wisdom imbedded within it in order to produce what Fathers purpose(d) plan is for today and us His body. In other words, it takes me a long time to put into practice (down here) what I received in seconds or minutes up there and it will take you a while to utilize all that the HS has downloaded into you. The really cool thing is that it's there, all of it. You can never lose it just like the parables of the talents (1,5,10) they never lost their gift but as they worked with them, it just kept producing more and even then, it didn't stop, the one(s) that made the most out of it were given even more and we as His body that are using those gifts and working with them as you are, are being given (or downloaded as you called it) more gifting that, as you are working with (1-what you have; 2-the new gifts downloaded) those gifts which were for the whole body but those who are sitting on them or have buried them then the angels are taking those and bringing them back to those worthy who will work with them to accomplish our Fathers purpose in His earth and to create His will and His kingdom here in His earth not Satans nor the agents of Satan. PS, for a better explanation of how those 'gifts' or 'knowledge' are downloaded , listen to Natan's interview by rabbi in Israel after having died and received knowledge quickly like I did. Or, just watch THE MATRIX and watch Trinity or Neo when they are 'downloaded' knowledge instantly-i.e. Trinity to fly a B212 helicopter; Neo learned combat training. Thomas, after reading your reply, I must ask you a very serious question, and please, I mean no disrespect, and it is not my intention to offend you.... but I want to clarify something you revealed in your response. You reference "3 men whom you had been studying on earth"... I just want to make sure that I understand what you are talking about, because I received a check in my spirit at those words. I say that because both my husband and myself have been approached by other Christians who say 3 white-bearded men (whom they perceived as messengers from God, and who called themselves "ascended masters") came to them offering accelerated knowledge from God. And this Christian friend said these "masters" had a message for my husband and myself. We immediately knew they were not from God, and our Christian friend was being deceived. We wanted to know nothing of their "message" for us, and refused what they offered. I want to make it very clear that when I say I received a "huge download" from God and the Holy Spirit, it came from reading Scripture and my mind being able to discern a deeper level of interpretation as to the Scripture's meaning. And this was followed by being "a good Berean" and searching more of Scripture to see if this new understanding could be backed up before I was willing to say it was God's Truth. Any new revelation or greater perception of Scripture's meaning came with the blessing of the Holy Spirit, or I rejected it. I am not trying to place judgment on your experience, and I apologize if my spiritual alarm system has misconstrued what you were trying to say. There is nothing else within your (as usual) erudite comment that concerns me. You are absolutely correct -- all of the gifts are available to each of us when the Holy Spirit indwells us because He brings all of the gifts with Him! I so enjoy your insight on these spiritual and Biblical matters and I hope you will continue to share! Pam, I thought that I replied to this yesterday but maybe I pushed the wrong button? No, I did not receive any further responses. Can you resend? Okay, sorry about that. I was in a rush and must have ? (who knows?) what I did to it? Okay, first off, perhaps what I did 'accidentally' was God's 'Purposing'. because, this morning, last night and yesterday morning were some of the 'strongest' or deepest encounters with Father and Yahuwshua our Messiah I think I've had and it has a (don't know how to describe it -I'm not as literary as I, well really you and so many others whom have that gifting and truly are blessing the body of Messiah, us. Secondly, the three (3) men whom I was referring to are not ascended masters but I was studying Nikola Tesla, Rudolf Steiner, and Victor Schauberger. And, what I said after that, was. 'Very good discernment! I am pleased at you picking up on that(which I've also seen in the past was one of those snookers I got tripped up on) and that is also a good teaching , not only on that, but a myriad of deceptive(nesses) of Satan. the 'downloads' you said you were receiving, HS showed me are similar/the same as and here is the part hardest to explain-when I was dead or had, for lack of a better word, a NDE, I not only was 'downloaded' information or knowledge or facts, but also, I had comprehension or understanding or (in one sense only of the word-i.e. not the full complete picture of wisely using and obeying the Word and the rewards accruing from that but) wisdom of how to use and apply that. Now, immediately upon being back in this body of flesh, my comprehension or understanding or, for lack of a better word, my ability to use that knowledge, information and facts, well, 'now' in this body, I have to 'walk it out' or walk out my faith and belief, if I can stretch that, for just a second, i.e. Now, I have to learn how to use it and place it into my Earthly mind and use it, either for the knowledge of good and evil or for the tree of life and the only door to that Tree of Life to enter through, while in this flesh 'suit'/body of flesh is through the blood of Yahuwshua HaMashiach and He is the Only Way to be able to thread the needle through all the myriad snookers of satan and the deceptive illusions which he controls,via the evil spirits, the 200 which the 20 captains or leaders of ten each are named in the book of Enoch. They have a (almost?) total control over every organization and especially every corporation within the world of man, the 'kosmos' of man. There is one more point also, but I think I had better, wisely��send this before I lose it ... again . Wow! That is a lot to take in... and again, I apologize if I am misunderstanding you... but if you adhere to the philosophies of Tesla and Steiner (I don't know anything about Schauerberger), then I'm afraid we will have to agree to disagree on that matter. Perhaps you are only studying their research in contrast to the Christian faith as exemplified in the Bible. You might want to read my not-so-complimentary blog on Tesla (if you haven't already): http://www.salvationandsurvival.com/2014/12/was-tesla-conduit-between-fallen-angels.html. And I find that the central principles of Steiner's philosophy don't align with what my Bible tells me about Christ. Namely, he believed 1) the being of Christ is central to all religions, though called by different names by each. (I can agree with that, but only Christianity presents Him in His full identity as the Son of the Most High God). 2) Every religion is valid and true for the time and cultural context in which it was born. (Valid? Maybe for the needs of those people at that time. But True? Not if you follow the Most High God). 3) Historical forms of Christianity need to be transformed in our times in order to meet the ongoing evolution of humanity. (This is perhaps the most disturbing aspect of Steiner's philosophy for me. It is precisely because the culture seeks to transform the faith Christ commanded that we the Church has evolved into a "lukewarm" image of its former self). In the end, it all seems to contradict what the Bible tells me about my God and how He wishes to be worshipped. All that being said, we are in total agreement that our spiritual self operates at a much higher level than our flesh and that the modern Church doesn't encourage the exploration of the relationship between our spirit and Jesus/Father God/Holy Spirit enough. Jesus is the Only Way to the Father, but we are seated with Him in heavenly places right now, and He has given us power and authority to affect this world for the Kingdom of God. We are spirit beings housed in temporary fleshly shells, and we don't know how to grow that spiritual side of ourselves. Jesus came to invade earth, bringing the Kingdom of God/Heaven to clash with the Kingdom of Darkness (this world which is governed by the god of this world, Satan). I believe that we are beginning to utilize the spiritual power that is available to us to continue to take back dominion of this earth from our Enemy. If the powerless Church will get out of the way, the devil would be less effective in his schemes to steal, kill, and destroy, and more captives could be set free to get in the fight. So, if I have misunderstood you, I ask that you forgive me. I always enjoy our discussions and even if we disagree, I appreciate the civility and mutual respect we offer each other. I am even in search of more of my God, and I can see that you are, too. Pam, thank you for 'epitomizing' with your comments (rebuke) of how I believe the 'called out ones' are to operate while still in this fleshly body. That to me is (one of) your gifting as you are not afraid to confront anything which you believe does not line up with the word and take it and chew it down until you have it cleaned out of leaven. I do appreciate that more than you suspect. That is The markings of the body of our Messiah beginning to take back our authority, not afraid to rebuke, correct, encourage and build up the body of Christ until we all attain unto that measure of the stature of the fullness of man. I had no idea of the humanistic leanings of Steiner although he was always more of an enigma to me while I was learning about natural fertilization ('organic' has been corrupted by USDA) and the principles which I learned through others who used his methods worked for me and my 'organic' fertilization part of the business I used to have. His method though, was more of a jumping off spot for me as I went on to learn more in depth means of restoring tree and soil health back to the earth. That said though, I want you to look at 'knowledge' vs philosophy for me. I admit that I never felt totally comfortable with Steiners methods but I attributed it, at the time, to ignorance of his technique. The impressive thing I saw using the fertilizer was the spectacular results I was able to achieve with it. Not so with chemical fertilizer nor most of the organic fertilizers! And through my contacts with steiners biodynamic fertilizer, I was able to meet and learn from the man who took his methods and (vortex compost tea brewer methods-schauberger's) and revealed the lies of science and agriculture which were destroying the life of the soil and land and even the oceans. Okay, so that helps me to lead in to my question. Does the 'knowledge' which they have make it satanic in purpose(of use) or is the 'knowledge' just the means whereby those with (intentions of ) nefarious purposes, utilize in order to usher in unsuspecting, read that as not discerning, christians? In other words, is that knowledge 'tainted' beyond and outside of a believers realm or, are we supposed to restore the truth of (in this case, fertilizer knowledge but it could be anything) that knowledge or information and eject the lies that have been hidden within it? Similar to the liver taking the life blood and ejecting out the toxins hidden within it.? Right now, I'm reminded of Jesus said, Beware the leaven of the Pharisees. He did not say to not hear them nor to not learn from them. They did have the Word of Scripture and they were in that position of authority, set up by God(I like to think of it as only allowed by God). It also reminds me of what Jesus said to his apostles when they told him they tried to stop some preaching in His Name because they/but were 'not of us' to which Jesus said, don't prevent them for they will not soon after be able to speak against Me. That of course, is not the same -preaching the word vs knowledge of fertilizer but? Does the principle apply? That's my question. And again, thank you, it is refreshing to be able to dig deep into things without the fear of someone being offended that how could you even think...of(and then they fill in the blank). Now, this will probably be considered heretical by in-the-box Christians, but if you read the Book of Noah within the Book of Enoch, (mind you, I am not reading it as the inspired Word of God, but since it is referenced in the Bible by Jude, I see it as reflecting the cultural thinking of the time) you will find a list of Fallen Angels (or Watchers, as Enoch calls them) who brought "knowledge" to mankind. For example, the one named Kasdeja "showed humans every wicked strikes of spirits and demons, the strike at the embryo in the womb (abortion), and to miscarry it…". Another, whose name was Gadreel, "showed humans the weapons of death, the coat of mail, the shield, and the sword for killing, every deadly weapon he showed to humans". So, I do not think it is a stretch to see that the technology that created the atomic bomb in the 20th Century could have had its origin from the technology revealed to humans by the Fallen Angels. But that same technology has resulted in small firearms which can be used by a righteous man to protect his family. Should everyone who legally carries a concealed weapon (to be used only in the defense of self or family) reject this method of self-defense because the wicked will use instruments of this technology to serve the dark side? I know this is quite different from your perspective on organic fertilizer, but I think it presents the same argument. And here's how I determine my philosophy on this question … Scripture says that what satan means for evil, God can use for good. And I think that applies to everything -- from fertilizer to weapons for self-defense. But I am very careful about extolling the virtues of someone whom I discern does not fear the Lord as I do, or is outspoken about their beliefs which are anti-Biblical. Anyone who worships spiritual forces other than YHWH and Yeshua, always give my heart and spirit a check. That is what I have discerned in the writings of Tesla and the little I know about Steiner. I do not think we can totally reject their research because everything created comes from God. Satan and the Fallen Angels did not create that technology (satan is incapable of creating anything) -- they just stole it from Heaven and then corrupted it to destroy their rivals, mankind. That being said, I also think they know things we are not supposed to know .. plutonium and uranium for nuclear fission (or is it fusion?) can have devastating effects upon mankind. Is it God's intention that we be messing with it? (There's probably a reason it is located deep in the earth, away from us). And I have the same question about the technology that has brought us IVF. Is it God's intention that we create our own babies? Mind you, these are questions that I am asking, myself, and I do not know God's mind, and do not presume that I have the answers. Therefore, I prefer to concentrate on determining how He wants me to live my life in service to His Kingdom. I trust He knows my heart should I have to make a decision in these weightier matters. Followers of the Way of Yahuwshua should be encouraging one another to dive deeper and helping one another by watching each others' back and standing in the gap for them, interceding and rejoicing when one of us manages to get set free from the bucket of oppression and despair. So, you're a fellow South Texan! I should have known that from your adeptness at expressing yourself and your beliefs, as I am blessed to be in the company of some other deep-divers here in the heart of our great state! And I agree, we should not have to give a qualifier for finding truth in Enoch or Jasher, for instance. But there is always someone who will accuse you of blasphemy for even reading them, so I always try to give an explanation as why I am willing to consider them as valuable resources to my understanding of the Bible. I guess maybe I am hoping that they might step outside the box and have their eyes opened just a little. That being said, we absolutely need to be encouraging and exhorting one another to grow in our knowledge of, and relationship with, the Father --- always being ready to make a defense to everyone who asks you to give an account for the hope that is in you... but with gentleness and respect, of course.